Abstract: Pyoderma gangrenosum (PG) is a rare disease, but commonly related to important morbidity. PG was first assumed to be infectious, but is now considered an inflammatory neutrophilic disease, often associated with autoimmunity, and with chronic inflammatory and neoplastic diseases. Currently, many aspects of the underlying pathophysiology are not well understood, and etiology still remains unknown. PG presents as painful, single or multiple lesions, with several clinical variants, in different locations, with a non specific histology, which makes the diagnosis challenging and often delayed. In the classic ulcerative variant, characterized by ulcers with inflammatory undermined borders, a broad differential diagnosis of malignancy, infection, and vasculitis needs to be considered, making PG a diagnosis of exclusion. Moreover, there are no definitively accepted diagnostic criteria. Treatment is also challenging since, due to its rarity, clinical trials are difficult to perform, and consequently, there is no “gold standard” therapy. Patients frequently require aggressive immunosuppression, often in multidrug regimens that are not standardized. We reviewed the clinical challenges of PG in order to find helpful clues to improve diagnostic accuracy and the treatment options, namely topical care, systemic drugs, and the new emerging therapies that may reduce morbidity. However, PG was not responsive to antibiotics, whereas corticosteroids and other immunosuppressive drugs, such as dapsone or clofazimine, consistently showed better results.2,3 The disease is currently recognized as a non-infectious inflammatory disease, but despite its inaccuracy, the term PG remains well entrenched in the medical literature. Classically, lesions begin as tender papules, papulopustules or vesicles, evolving into painful and rapidly enlarging ulcers. Healing frequently leaves a cribriform scar, which may lead to considerable disfiguring.4,7 On histology, PG lesions do not display specific features, being typically characterized by a prominent dermal neutrophilic infiltrate with abscess formation, with no signs of infection and usually without significant vasculopathy. The etiology of PG is still unknown, and its pathophysiology is far from being completely understood. Inflammatory bowel disease (IBD), PAPA (pyogenic arthritis, PG, and acne) syndrome and PAPA-related syndromes, frequently evolve with PG; furthermore, other neutrophilic skin diseases, namely Sweet’s syndrome (SS) or Behçet’s disease, share clinicopathological aspects with PG. Based on the clinical, immunological, and genetic studies, concerning the diseases related to PG, we may assume that several factors may concur to PG physiopathology. A genetic background and an altered immune and inflammatory response are certainly involved, although triggers have not yet been identified. The diagnosis is commonly challenging and delayed, and misdiagnosis is also frequent, mostly by non-dermatologists who are less aware of this entity. 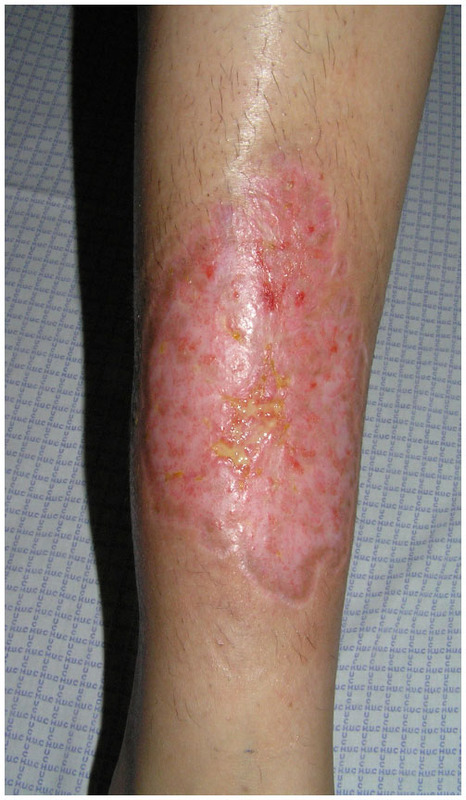 The multiple clinical variants (classic ulcerative, pustular, bullous, and superficial granulomatous), and the overlapping forms with other neutrophilic diseases, frequently observed in clinical practice, make the diagnosis even more difficult.8,25 Moreover, there are countless causes for skin ulceration, including infections, tumors, vascular disorders, vasculitis, and trauma, which make PG a diagnosis of exclusion (Table 1). Note: Bennett ML, Jackson JM, Jorizzo JL, Fleischer AB Jr, White WL, Callen JP. Pyoderma gangrenosum. A comparison of typical and atypical forms with an emphasis on time to remission. Case review of 86 patients from 2 institutions. Medicine (Baltimore). 2000;79(1):37–46. Copyright © 2004, John Wiley and Sons. Figure 1 (A) Ulcerative stage of a pyoderma gangrenosum lesion, showing the typical violaceous, raised undermined border, with a granulation base, surrounded by a erythematous halo. (B) Healing stage, after 4 days therapy with systemic corticosteroids and cyclosporine, showing a decrease in the surrounding inflammation. 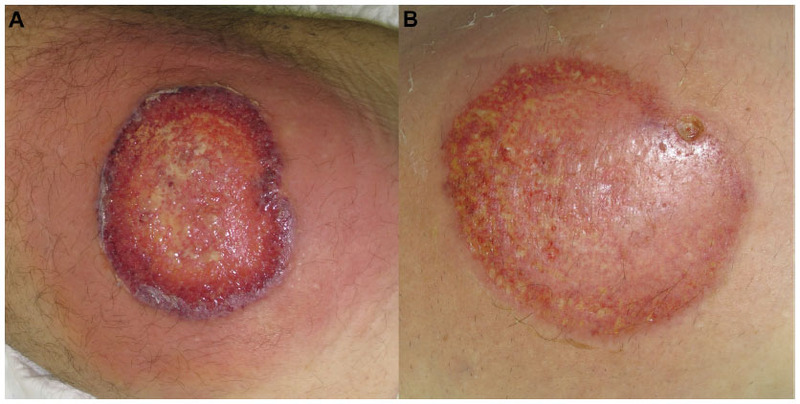 Figure 2 (A) Ulcerative stage of classical and rapidly progressive pyoderma gangrenosum ulcer, showing an elevated, violaceous, undermined border, with a necrotic and hemorrhagic base. (B) The healing stage ulcer, 3 months after systemic therapy, presenting the “Gulliver” sign; ulcer base containing granulation tissue, and necrotic tissue in a lesser extent. Figure 3 Characteristic cribriform scar after healing of pyoderma gangrenosum. Figure 4 Bullous variant of pyoderma gangrenosum, in a patient with acute myeloid leukemia, presenting overlap features with bullous variant of Sweet’s syndrome. The work-up starts with a cutaneous biopsy that preferentially includes the border of the ulcer and the adjacent skin. Histology is essential to exclude vasculitis and malignancy, and special stains and tissue cultures may also be used to rule out infection. Complete work-up should include extensive blood and urine screening (complete blood cell count, chemistry and liver function tests, erythrocyte sedimentation rate and CRP, urine and serum protein electrophoresis or immunofixation, anti-nuclear antibodies and anti-neutrophil cytoplasmatic antibodies) and colonoscopy, in order to exclude underlying coexisting conditions, namely IBD, inflammatory, autoimmune, and neoplastic diseases. Pathological skin changes depend on the type of lesion (ulcerative, pustular, bullous, and superficial granulomatous), stage of evolution, and the site from where the specimen is obtained. The active untreated expanding lesions typically show dense neutrophilic dermal infiltrates, often forming micro-abscesses and occasionally extending to the subcutis. Vasculitis is not the main observation, but it may occur along with leukocytoclasia. The fully developed ulcers may only present marked tissue necrosis and surrounding mononuclear cell infiltrates.25 However, none of these histological features is pathognomonic. Treatment is challenging; there is no universally accepted “gold standard” and although a small trial has been published, comparing infliximab to placebo, no randomized controlled trials have been performed for the usual systemic therapies.40,41 Little evidence supports a rational therapeutic approach to this clinical entity, and currently, treatments are mostly trying to target a broad spectrum of immunologic mediators and inflammatory cells, shown to be involved in PG, including neutrophils, lymphocytes, and cytokines. It is important to highlight the equal importance of treating the inflammatory state, balanced with optimized wound care.51 Therefore, wound dressing is particularly important, since most ulcers show heavy exudates. Occlusion is not recommended in highly active progressing ulcers with inflammatory borders but may be beneficial in slow healing ulcers after the resolution of inflammatory component. Over the past decade, PG has been reported to respond to many different biologic medications, most commonly, to anti-TNF drugs such as etanercept, adalimumab, certolizumab, and infliximab.6,55,56 Infliximab (5 mg/kg) represents the biological drug most widely studied in PG, and was demonstrated to be superior to placebo in a randomized control trial.23,41,57 Furthermore, ustekinumab (anti-IL12/IL23) has been recently used in the management of PG with good results, and anakinra (anti-IL1) induces a very good response in patients with PAPA syndrome.11,44,46 However, since biologic therapies are relatively new, their unknown long-term side effects should be taken into consideration. When this combination fails, less conventional treatments are chosen, generally based on immunosuppressive drug combinations used in other immune diseases, which are considered relatively safe. The common combinations are: 1) methotrexate and infliximab, and 2) cyclosporine, mycophenolate mofetil, and prednisone. PG is a rare challenging disease, described more than a 100 years ago as an infection, and that is now included within the spectrum of neutrophilic diseases or auto-inflammatory syndromes. The diagnosis can be difficult, particularly for non-dermatologists who seldom recognize this entity, but also for dermatologists, as there is no pathognomonic biomarker, clinical or histological feature. Moreover, there are no definite diagnostic criteria or severity parameters established, that could facilitate multicenter randomized clinical trials to improve therapy of this condition. Farhi D. The clinical and histopathological description of geometric phagedenism (pyoderma gangrenosum) by Louis Brocq one century ago. Arch Dermatol. 2008;144(6):755. Gold S. Pyoderma Gangrenosum. Proc R Soc Med. 1956;49(4):234–235. Muende I. Pyoderma Gangrenosum. Proc R Soc Med. 1960;53(4):296–297. Su WP, Davis MD, Weenig RH, Powell FC, Perry HO. 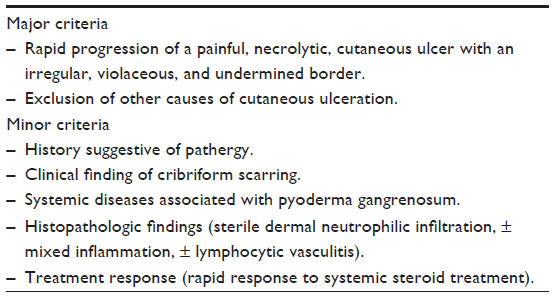 Pyoderma gangrenosum: clinicopathologic correlation and proposed diagnostic criteria. Int J Dermatol. 2004;43(11):790–800. Wollina U. Pyoderma gangrenosum – a review. Orphanet J Rare Dis. 2007;2:19. Wines N, Wines M, Ryman W. Understanding pyoderma gangrenosum: a review. MedGenMed. 2001;3(3):6. Hemp L, Hall S. Pyoderma gangrenosum: from misdiagnosis to recognition, a personal perspective. J Wound Care. 2009;18(12):521–526. Alavi A, Sajic D, Cerci FB, Ghazarian D, Rosenbach M, Jorizzo J. Neutrophilic dermatoses: an update. Am J Clin Dermatol. 2014;15(5):413–423. Cardoso JC, Coelho S, Gonçalo M, Oliveira H, Brites MM, Figueiredo A. Pioderma gangrenoso da parede abdominal após cesariana [Pyoderma gangrenosum of the abdominal wall after cesarean]. Trab Soc Port Dermatol Venereol. 2008;66:245–250. Tanaka N, Fujioka A, Tajima S, Ishibashi A, Hirose S. Elafin is induced in epidermis in skin disorders with dermal neutrophilic infiltration: interleukin-1 beta and tumour necrosis factor-alpha stimulate its secretion in vitro. Br J Dermatol. 2000;143(4):728–732. Kluger N. Ustekinumab for pyoderma gangrenosum. Arch Dermatol. 2012;148(5):655. Kabashima R, Sugita K, Sawada Y, Hino R, Nakamura M, Tokura Y. Increased circulating Th17 frequencies and serum IL-22 levels in patients with acute generalized exanthematous pustulosis. J Eur Acad Dermatol Venereol. 2011;25(4):485–488. Marzano AV, Cugno M, Trevisan V, et al. Role of inflammatory cells, cytokines and matrix metalloproteinases in neutrophil-mediated skin diseases. Clin Exp Immunol. 2010;162(1):100–107. Marzano AV, Fanoni D, Antiga E, et al. Expression of cytokines, chemokines and other effector molecules in two prototypic autoinflammatory skin diseases, pyoderma gangrenosum and Sweet’s syndrome. Clin Exp Immunol. 2014;178(1):48–56. Keller M, Spanou Z, Schaerli P, et al. T Cell-regulated neutrophilic inflammation in autoinflammatory diseases. J Immunol. 2005;175(11):7678–7686. Caproni M, Antiga E, Volpi W, et al. The Treg/Th17 cell ratio is reduced in the skin lesions of patients with pyoderma gangrenosum. Brit J Dermatol. Epub January 20, 2015. Guenova E, Teske A, Fehrenbacher B, et al. Interleukin 23 expression in pyoderma gangrenosum and targeted therapy with ustekinumab. Arch Dermatol. 2011;147(10):1203–1205. Marzano AV, Cugno M, Trevisan V, et al. Inflammatory cells, cytokines and matrix metalloproteinases in amicrobial pustulosis of the folds and other neutrophilic dermatoses. Int J Immunopathol Pharmacol. 2011;24(2):451–460. Duchatelet S, Miskinyte S, Join-Lambert O, et al. First Nicastrin mutation in PASH syndrome. Br J Dermatol. Epub January 20, 2015. Defilippis EM, Feldman SR, Huang WW. The genetics of pyoderma gangrenosum and implications for treatment: a systematic review. Br J Dermatol. Epub October 28, 2014. Bruzzese V. Pyoderma gangrenosum, acne conglobata, suppurative hidradenitis, and axial spondyloarthritis: efficacy of anti-tumor necrosis factor α therapy. J Clin Rheumatol. 2012;18(8):413–415. Goodarzi H, Sivamani RK, Garcia MS, et al. Effective Strategies for the Management of Pyoderma Gangrenosum. Adv Wound Care (New Rochelle). 2012;1(5):194–199. Kowalzick L, Bertolini J, Baumann C, Walther B, Truhm B, Eickenscheidt L. Paradoxical reaction to etanercept: development of pyoderma gangraenosum during therapy of psoriasis arthritis. J Dtsch Dermatol Ges. 2013;11(5):447–449. Ruocco E, Sangiuliano S, Gravina AG, Miranda A, Nicoletti G. Pyoderma gangrenosum: an updated review. J Eur Acad Dermatol Venereol. 2009; 23(9):1008–1017. Pereira N, Brites MM, Gonçalo M, Tellechea O, Figueiredo A. Pyoderma gangrenosum – a review of 24 cases observed over 10 years. Int J Dermatol. 2013;52(8):938–945. Wu XR, Shen B. Diagnosis and management of parastomal pyoderma gangrenosum. Gastroenterol Rep (Oxf). 2013;1(1):1–8. Nguyen TV, Cowen EW, Leslie KS. Autoinflammation: From monogenic syndromes to common skin diseases. J Am Acad Dermatol. 2013;68(5):834–853. Tüzün Y, Maraşoğlu O. Pyoderma Gangrenosum. J Turk acad Dermatol. 2007;1(3):71301r. Reichrath J, Bens G, Bonowitz A, Tilgen W. Treatment recommendations for pyoderma gangrenosum: an evidence-based review of the literature based on more than 350 patients. J Am Acad Dermatol. 2005;53(2):273–283. Landis ET, Taheri A, Jorizzo JL. Gulliver’s sign: A recognizable transition from inflammatory to healing stages of pyoderma gangrenosum. J Dermatolog Treat. In press 2014. Von den Driesch P. Pyoderma gangrenosum: a report of 44 cases with follow-up. Br J Dermatol. 1997;137(6):1000–1005. Patel F, Fitzmaurice S, Duong C, et al. Effective Strategies for the Management of Pyoderma Gangrenosum: A Comprehensive Review. Acta Derm Venereol. In press 2014. Omiya W, Ujiie H, Akiyama M, et al. Coexistence of pustular and vegetative pyoderma gangrenosum in a patient with myelodysplastic syndrome. Eur J Dermatol. 2012;22(5):711–712. Feliciani C, De Simone C, Amerio P. Dermatological signs during inflammatory bowel diseases. Eur Rev Med Pharmacol Sci. 2009;13 Suppl 1:15–21. Speeckaert R, De Smet L, De Schepper S, et al. Pyoderma gangrenosum with granuloma formation: not always a benign disorder. J Eur Acad Dermatol Venereol. Epub August 29, 2014. Dasanu CA, Bockorny B, Alexandrescu DT. Pyoderma gangrenosum due to lenalidomide use for multiple myeloma. J Oncol Pharm Pract. In press 2014. Duchnowska R, Ziajka E, Góralska A, Grala B. Recurrent pyoderma gangrenosum precipitated by breast cancer: a case report and review of the literature. J Med Case Rep. 2014;8:226. Doria A, Zen M, Bettio S, et al. Autoinflammation and autoimmunity: bridging the divide. Autoimmun Rev. 2012;12(1):22–30. Craig FF, Thomas KS, Mitchell EJ, et al. UK Dermatology Clinical Trials Network’s STOP GAP trial (a multicentre trial of prednisolone versus ciclosporin for pyoderma gangrenosum): protocol for a randomised controlled trial. Trials. 2012;28;13:51. Brooklyn TN, Dunnill MG, Shetty A, et al. Infliximab for the treatment of pyoderma gangrenosum: a randomised, double blind, placebo controlled trial. Gut. 2006;55(4):505–509. Sharon V, Burrall B, Patel F, et al. Multimodal therapy of idiopathic pyoderma gangrenosum. Dermatol Online J. 2014;15;20(6). Andrade P, Brites MM, Figueiredo A. Synchronous pyoderma gangrenosum and inflammatory bowel disease, healing after total proctocolectomy. An Bras Dermatol. 2012;87(4):637–639. Cosgarea I, Lovric Z, Körber A, Dissemond J. Successful treatment of refractory pyoderma gangrenosum with ustekinumab only after excision of renal cell carcinoma. Int Wound J. Epub October 8, 2014. Pazyar N, Feily A, Yaghoobi R. An overview of interleukin-1 receptor antagonist, anakinra, in the treatment of cutaneous diseases. Curr Clin Pharmacol. 2012;7(4):271–275. Naik HB, Cowen EW. 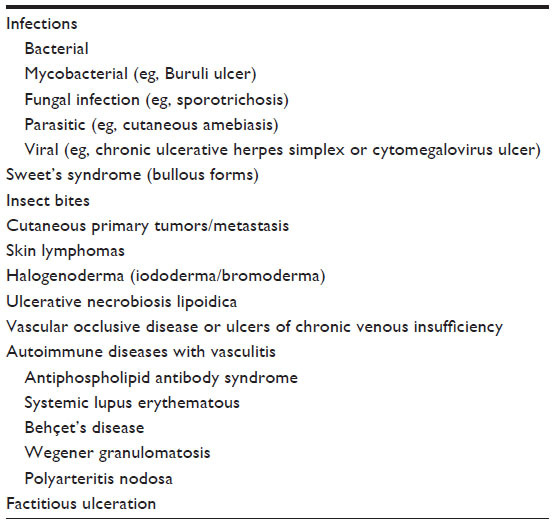 Autoinflammatory pustular neutrophilic diseases. Dermatol Clin. 2013;31(3):405–425. Ye MJ, Ye JM. Pyoderma gangrenosum: a review of clinical features and outcomes of 23 cases requiring inpatient management. Dermatol Res Pract. Epub October 8, 2014. DeMartyn LE, Faller NA, Miller L. Treating peristomal pyoderma gangrenosum with topical crushed prednisone: a report of three cases. Ostomy Wound Manage. 2014;60(6):50–54. Kapila S, Reid I, Dixit S, et al. Use of dermal injection of activated protein C for treatment of large chronic wounds secondary to pyoderma gangrenosum. Clin Exp Dermatol. 2014;39(7):785–790. Liu DY, Fischer R, Fraga G, Aires DJ. Collagenase ointment and topical timolol gel for treating idiopathic pyoderma gangrenosum. J Am Acad Dermatol. 2014;71(5):e225–e226. Imus G, Golomb C, Wilkel C, Tsoukas M, Nowak M, Falanga V. Accelerated healing of pyoderma gangrenosum treated with bioengineered skin and concomitant immunosuppression. J Am Acad Dermatol. 2001;44(1):61–66. Sick I, Trautner B, Ruzicka T. [Surgical management of Pyoderma gangrenosum]. Hautarzt. 2012;63(7):577–583. German. Cafardi J, Sami N. Intravenous immunoglobulin as salvage therapy in refractory pyoderma gangrenosum: report of a case and review of the literature. Case Rep Dermatol. 2014;23;6(3):239–244. Sinnya S, Hamza S. Pyoderma gangrenosum of the breast treated with intravenous immunoglobulin. J Dermatol Case Rep. 2013;30;7(2):64–68. Campanati A, Brisigotti V, Ganzetti G, et al. Finally, recurrent pyoderma gangrenosum treated with Adalimumab: case report and review of the literature. J Eur Acad Dermatol Venereol. In press 2014. Cinotti E, Labeille B, Perrot JL, Pallot-Prades B, Cambazard F. Certolizumab for the treatment of refractory disseminated pyoderma gangrenosum associated with rheumatoid arthritis. Clin Exp Dermatol. 2014;39(6):750–751. Staub J, Pfannschmidt N, Strohal R, et al. Successful treatment of PASH syndrome with infliximab, cyclosporine and dapsone. J Eur Acad Dermatol Venereol. In press 2014. Langan SM, Groves RW, Card TR, Gulliford MC. Incidence, mortality, and disease associations of pyoderma gangrenosum in the United Kingdom: a retrospective cohort study. J Invest Dermatol. 2012;132(9):2166–2170. Bennett ML, Jackson JM, Jorizzo JL, Fleischer AB Jr, White WL, Callen JP. Pyoderma gangrenosum. A comparison of typical and atypical forms with an emphasis on time to remission. Case review of 86 patients from 2 institutions. Medicine (Baltimore). 2000;79(1):37–46.